This bottle of moisturizer was sitting behind a locked glass door at CVS. 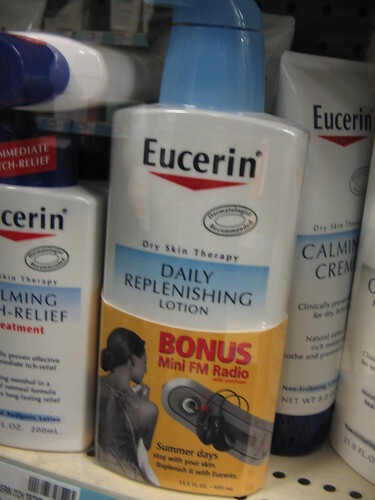 Free Mini FM radio with your lotion! I’m curious as to what PR/Marketing exec thought that one up. “I know! We’ll offer free cheap FM radios with our lotions! Of course that’ll be prone to shoplifting, so they’ll have to be locked behind glass doors! That’ll really boost sales! Wow, FM radios!” Maybe I should buy one of these lotions and try out the radio as a re-kick-off for Cheap and Tiny. I’d pay 50 dollars for one of those! If you’ve got a Dollar Tree store nearby, you can get a simiilar FM radio for $1.